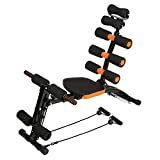 8-in-1 Ab Trainer Core Workout Bench Body Workout Machine The 8-in-1 trainer features a whole body workout in just one machine! With this machine you can ab crunch oblique twist bicep curl chest press leg extrension lateral raise push ups and stretch exercise. The machine is ideal for strengthening your upper lower and middle abdominal. The backrest can be adjusted up to three tilting positions to provide total support for different levels of workout. The cross bar is adjustable up to 3 levels to meet the user’;s comfort.